When you put a card on top of your deck, you may exhaust this card to put a Cutie Mark counter on this card. 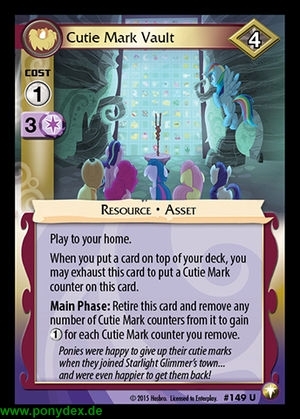 Main Phase: Retire this card and remove any number of Cutie Mark counters from it to gain 1 action token for each Cutie Mark counter you remove. Ponies were happy to give up their cutie marks when they joined Starlight Glimmer's town... and were even happier to get them back!